The Retirement Planning Specialist (RPS) opportunity is for an individual or group who wish to add FreedomFlex to their portfolio of products but do want or require specialized coaching or training for developing a professional financial service firm. Recommended course for your state license exam click here. To obtain your temporary license click here. The American Associations of Government & Private Employees and its affiliate companies, acknowledge that you have expressed an interest in becoming a Retirement Planning Specialist (RPS) for The Associations. This document’s purpose is to clarify the initial guidelines of what is required to become a Retirement Planning Specialist (RPS). Be responsible for completing all state insurance licensing requirements and costs. No commissions will be paid unless a license is maintained. Be responsible for completing all online training and tests. Maintain a minimum enrollment average of one app per week (or four per month) in order to receive advanced commissions. Must never go 60 days with out writing business or contract will be terminated for no activity. Review the example contracting paperwork. Please print and fill it out. Submit the completed and legible document. When contracting a sub account the are specific items in the contract you must fill out as the overseeing manager. Review the sample to learn out to fill out the contract for a sub account. The assessment is phase one of an easy marketing approach method. It has been tested and utilized for over 15 years as a successful way to set an appointment. It is designed to peak the prospect’s interest and allows them to opt in for an estimate. It works best when a surveyor asks the prospect the questions in person. Below is a general script that can be used to perform an assessment. Hello (prospect’s name), this is (your name) with (business name). We are performing retirement assessments on currently working individuals to see how they are preparing for retirement. Do you have one minute to complete a six question assessment? This is (your name) with (business name), we (service you provided them) this past year. I am calling you because we know that many of our clients are not saving and accumulating any money for retirement. We also know, at best, social security will only provide you with half of your current income for retirement. So, we are performing retirement assessments on all our clients to see how they are preparing for retirement, and see if there is anything we can do to help. Do you have one minute to complete a six question assessment? The estimate is the second part of the marketing system. It is designed to follow up the assessment with some product highlights creating an easy environment to set an appointment. It works best when performed in person while providing the prospect with the information. Below are instructions and a general script that can be used to provide the estimate. For each completed assessment with “YES” for questions 6 you will need to complete an Estimate Handout. The numbers needed to fill the blanks are obtained from the Estimator Tables and the completed survey. Retirement example @ $____ per month. That number is on the estimator table in the first row in parentheses. Just choose the number that corresponds with the weekly contribution (question #5) the prospect selected on the survey. For example, if the prospect selected “$35 per week,” the number for the blank is “143”. For the first blank enter the prospects age. For the second number use the estimator table. Choose the nest egg value that matches the prospects age and the monthly contribution (question #5) from the survey. For example, a 30-year-old male, choosing $35 per week, the nest egg would be $669,665. Choose the monthly value that matches prospects age and the monthly contribution (question #5) from the survey. For example, a 30-year-old male, choosing $35 per week, the monthly would be $7,670.42. Also make sure you write in the information in the box at the bottom of the page. Hi (prospect), you were kind enough to complete a retirement assessment conducted by (surveyor name). You indicated on the assessment that you wanted to receive an estimate. I am here to provide you with that. 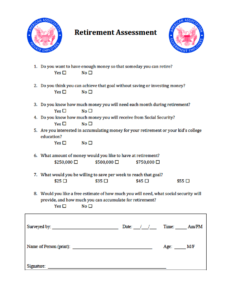 Now based on your selection of (answer on question 4 of survey), you prequalify for a plan that can provide you with a nest egg of (estimator table – nest egg) at age 65. This could provide you a monthly income of (estimator table – monthly) for the rest of your life. This is a unique cash accumulation plan. 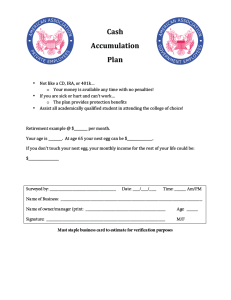 If you were to get sick or hurt and can’t work, this would probably be the first thing that you would stop paying, so if you qualify, the plan provides protection benefits, so the (answer on question 4 on the assessment) a week is paid for you and your nest egg will still be there. This plan also provides a college planning feature which helps your children, who are academically qualified, the ability to go to the college of their choice. If this looks interesting to you, I would like to make an appointment to show you how the plan works and how I come up with these numbers. It will take us about 15-20 minutes to work through the information (At this point you pull out your appointment book, set up an appointment with them.). The Quick Quote Presentation is the system you use in your appointment to present the numbers, the plan, the product, and close the sale. Learn how the software works. 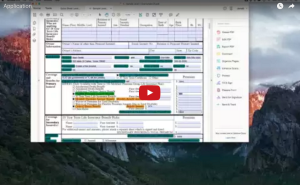 Watch this instruction video on how to utilize the software and its features. WARNING: If you have a hard time reading the text in the video you can click the “YouTube” button in the lower right hand corner of the player. This will take you to YouTube where you can enlarge the video. Once it is enlarged it will take 10-20 seconds for the resolution to improve. Learn how to present with the software. Watch this instruction video on how to present using the software. Download the script and watch the video as many times as it takes to learn it. This is the single most important step for writing business. ***We have an offline version you can use to present the numbers and the plan as well. If the client does not have any questions then, move on to submitting the application. In the event the client has some questions before enrollment, you can use the answers below. How can $100 a month turn into that much? This chart will show you an example of how the power of time and compounding interests works to grow money. When you begin making your contributions, the money flows into the plan. A portion goes to both the benefit and growth sides of the plan. In the first year, your base plan growth is in a time deposit, this is like a 10-year bank CD. The money goes in the first year and is then paid back to you in the 10th year at a 260% of the original value tax fee guaranteed, which is equivalent to a 10% growth rate. Any additional contributions or overfunding of your plan will go into the annuity, which has a guaranteed rate of 3% with no fees, no minimums, no maximums and no surrender charges. This means you have access to your money. Beginning in the second year you get to choose where your money grows. You can choose to let your money grow in the guaranteed annuity account, which I just described to you, or you can choose the service option, which allows you to send your money to an investment account of your choice. If you do not have an account, we provide you access to a couple of top performing mutual funds with historical averages of over 12%. At any point in time you can redirect your growth side money where ever you choose. In the 10th year you have another choice. You can stop all your contributions and let your money sit and grow, or you can stop the benefit side and continue the growth side, or your can continue your plan as is. The great thing is it is up to you and you don’t have to make that decision now because there is now way to predict where you will be at that point in time. Can I save a different amount? Which one of these options best works for you? 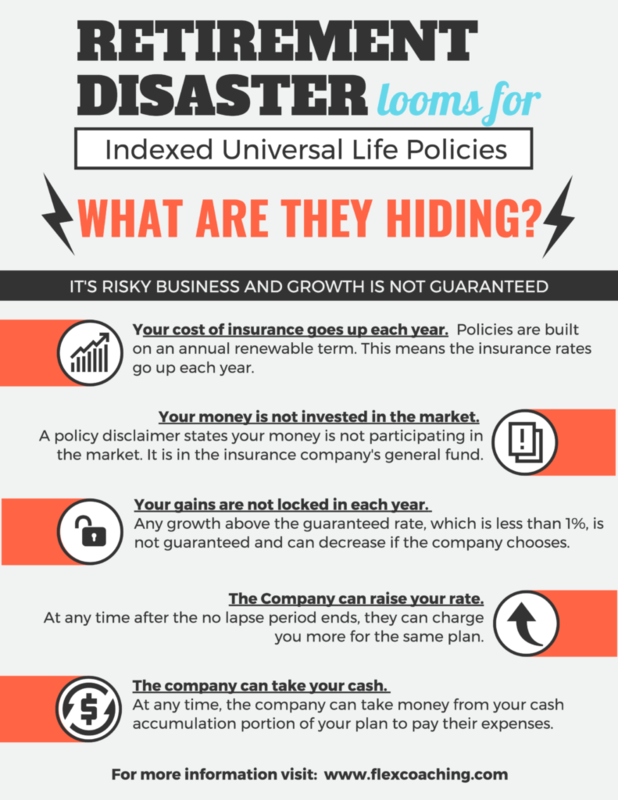 The level one plans come with the early death and terminal illness coverage. The level two plans add the critical illness and disability coverage. What happens if I need to stop making my payments? The plan is designed for a ten year commitment. If for some reason you cannot complete the first ten years, then you can lose all or part of your first year time deposit. Any funds you have accumulated in either of the growth options you will get to keep. What company is this with? We believe what one company can do for you an alliance of companies can do better. 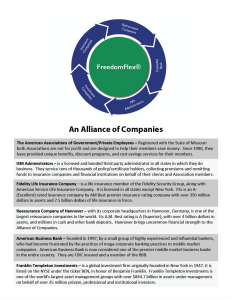 The companies involved came together to provide FreedomFlex, with all of its unique features, as a benefit to the American Associations of Government and Private Employees. Do you have an example of someone who actually achieved the numbers on the quote? 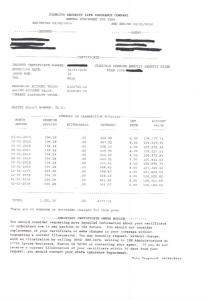 While disclosing a client’s financial information is illegal, I can show you an example statement that has been redacted. 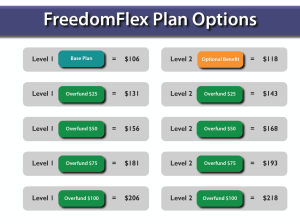 This person enrolled in a level one plan at the age of 20 and has had the plan for 16 years. Enrollment applications are state specific; download the appropriate application. Learn how to fill out the application by following the instructions in this video. You can also review one of the sample applications as a reference. Make sure to use the quick sheets that matches the plan you are writing. Policy delivery is essential to prevent a new client from canceling their policy. A delivery receipt signed by the client is required to complete the transaction. Become an expert on FreedomFlex by reviewing all of the information (explainer video, concept video, comparison chart, alliance of companies chart, unique features video on the product page. Step 1: This is the destination or outcome of where you want to arrive. This is a critical step because you cannot reach a destination if you do not know the location or the route to take. How much income/revenue would you like to generate from this opportunity? How many weekly enrollment apps will it take to reach that income/revenue number? To help you determine that number use the RPS income calculator. Use the blue box to set the number of enrollment apps per week. The black column displays the monthly income for the number of apps. Minimum Goal: To receive commission advances the RPS must enroll 1 client per week. Optimal Goal: With proper implementation the RPS can enroll 5 clients per week. How does the number you came up with compare to these goals? Decide on a final weekly enrollment app goal. In order to reach your weekly goal you will need to perform some additional tasks. You will need to set aside time for administration and additional steps. 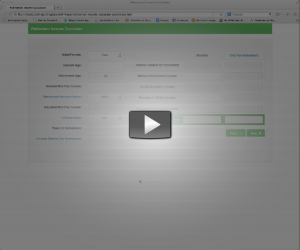 Step 2: This is the first stage of your marketing system for generating leads. A lead is called a prospect and the process for locating them is called prospecting. Define the profile of a prospect. Anyone between the ages 18 and 55 with income between $36,000 and $100,000 is a potential prospect. This is the process of locating a contact name, contact information and consolidating the information into a single location. Each phase is a type of lead that will be utilized when Making the Approach. Your current clients are the easiest way to begin making sales. Start here while developing phase 2 & 3. Analyze your clientele and identify each client that fits the profile. Identify the contact name and information (address, phone, email) you have for each client. Compile the information into one location (you can use this spreadsheet). Leads are the lifeblood to your business. We will provide you a spreadsheet with the business listings in your area that you will contact. Provide your Territory Account Executive with the zip code(s) in your area. Partnerships are a great way to cultivate a lead source. There are three types of preferred partnerships for generating leads. Compiling the information depends on which partnership you wish to pursue. For this partnership you need run a search on yellowpages.com for “tax return preparation” in your area. Record the business contact information and the contact name (manager/owner). Cross reference the listing on Manta.com to identify a contact name. If the contact point is not listed on manta, then perform a secondary search on the business listing’s website. If a contact name cannot be identified then you can call (of visit) the listing and ask for the information. You will need to keep track of this information in one location (you can use this spreadsheet). For this partnership you need run a search on yellowpages.com for “auto/home/commercial insurance” in your area. Exclude listing for captive agents such as State Farm and Allstate. If the contact point is not listed on manta, then perform a secondary search on the business listing’s website. If a contact name cannot be identified then you can call and ask for the information over the phone. For this partnership you need run a search on yellowpages.com for “health insurance” in your area. Step 3: This is second stage of your marketing system. It involves contacting the prospect and delivering the approach in order to secure an appointment for making the presentation. Your approach is what you say to prospects to generate interest in order to secure the Quick Quote Presentation appointment. In your approach you use helpful and attractive statements. We have developed three approach methods to use with your current clients. For lead generating, we have created five methods for you to utilize. Use the systems below to set an appointment with current clients. Perform a survey, provide an estimate and book the appointment using the survey script. Face to face is best option, but can be successful by phone as a secondary option. Mail a current client the lottery letter according to the instructions. Use the follow up script and perform a survey, provide an estimate, and book the appointment. Use follow up script and perform a survey, provide an estimate, and book the appointment. Use any of the systems below to set an appointments with small business owners and the self employed. Mail the contact point an association lottery letter according to the instructions. Follow up in person and use the follow up script to set an appointment. Present the system and product according to the appointment script. Once you have close the owner/manager you need to set the procedure for rollout to employees. Determine how the announcement will be done, such as a memo or staff meeting. Determine how much time you will be allowed to spend with each employee to survey, estimate, and present. Follow the instructions to hire and train a surveyor. Provide surveyor a specific area to survey. Train the surveyor to follow the survey script and instructions. Follow up with an estimate based on the script and instructions to book the appointment. Email your prospect using the template. Have a telemarketer call the prospect using the script to book you an appointment. Begin posting about retirement using articles from our blog posts. Make sure you link the original article in your post not our blog. Our blog is designed for agents not consumers. Use an intriguing title in your post then link the original article. 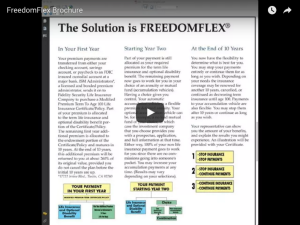 Post the the FreedomFlex explainer video with an intriguing title. Continue posting the retirement articles and mix in the FreedomFlex video posts every third post or so. Step 4: This is a sit down face-to-face appointment where you use the Retirement Income Analysis (RIA) software and convert the prospect into a customer. Learn the presentation by reviewing the two videos on the RIC software. Watch the video and or read the script until you can perform it in front of a mirror. Then select two individuals (friends or family) to perform a practice run. Learn each question and its response in order to handle these if they come up with a client. Practice reciting the script and or videos until you can do it in front of a mirror. Execute the Quick Quote Presentation with the client. Once you have finished reviewing the last page of the software print two copies of the summary. If the client opts not to enroll, have the client sign both copies of the RIA summary waiver form. Give them a copy to take and keep one for your records. Follow up with them in 30 days to see if they have changed their mind. Step 5: This is the enrollment application process and policy delivery to the customer. Follow these instructions to fill out and submit the enrollment application. Follow these instructions to prepare and deliver the policy. Remain an expert by keeping up with the latest market information from our blog. The job can be performed using various computer, laptop or tablet combinations. While we prefer to use iMac, MacBooks, and iPads, you can choose to use windows computers and android tablets as well. In addition to a computer or tablet you will need a printer that has scanning capabilities. You will also need to have access to the internet to utilize our system and software. Our system can be run on different computer and tablet platforms and combinations. Some are easier than others, but we are working to simplify all of them. Below is the necessary software needed to run all software and perform all tasks of the job in each platform.